Always meaning to read L.P.H. – He is recommended by Antony Burgess. 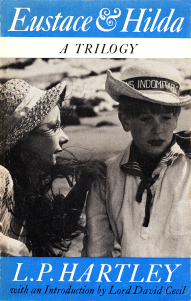 Eustace and Hilda by L. P. Hartley is a single-volume edition of three novels: The Shrimp and the Anemone (pub. 1944), The Sixth Heaven (1946) and Eustace and Hilda (1947). This collection also includes and additional forty page story called Hilda’s Letter which, as far as I can ascertain, was first published in this collected edition in 1958. My copy is a Faber and Faber edition published in 1979 with a cover showing the two young actors from a BBC adaption of the whole trilogy. As far as I can tell this edition is out of print in the U.K. but there is an attractive looking U.S. edition (NYRB) available. The single volume edition of The Shrimp and the Anemone may also still be relatively easy to obtain.